There's disturbing news to report coming out of the Lafayette Parish, Louisiana area, where two pedophiles who were in a relationship together are now facing over 170 criminal charges against them. Authorities say that both 30-year-old Rusty Quirk, and his lover, 33-year-old Megan McCoy, were arrested and detained by the Attorney General Jeff Landry's Office as part of the investigation. 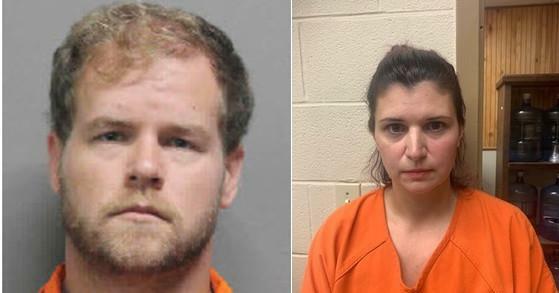 After execution of a search warrant at their home on 200 Blk Parklane Road in Lafayette Parish, authorities would find enormous evidence of the crimes committed by the duo. Rusty Quirk was arrested on 100 counts of possession of sexual abuse images/videos of Children (under 13), 35 counts of distribution of sexual abuse images/videos of children (under 13), and two counts of production of sexual abuse images/videos of children (under 13). Megan McCoy was arrested on 35 counts of possession of sexual abuse images/videos of children (under 13). Quirk was booked into the Lafayette Parish Jail, and McCoy was booked into the St. Landry Parish Jail. The investigation involved numerous law enforcement agencies, including the Louisiana Bureau of Investigation’s Cyber Crime Unit, Homeland Security Investigations, the U.S. Customs, and Border Patrol, the Lafayette Parish Sheriff’s Office, and the St. Landry Parish Sheriff’s Office. The Attorney General’s Office asks that anyone with additional information on this case to please contact the LBI at (800) 256-4506 where callers may remain anonymous.